Netflix and chill? There's an app for that. The phrase has taken the Internet by storm. A year ago, the saying "Netflix and chill" would have been taken at face value. Now, it's used as a code for hooking up and become a meme of itself. 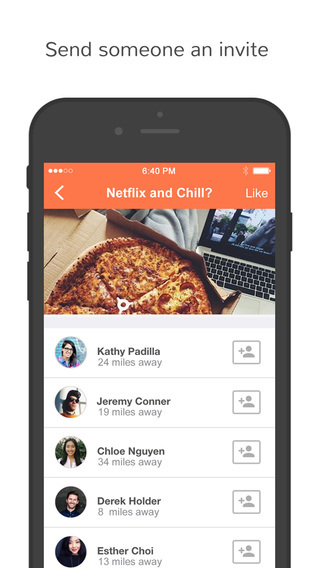 Now, the app TikiTalk has just launched and it's designed just for people who want to "Netflix and chill." As Fusion reported, the dating app was designed by developers in California and France and launched its newest version for iPhones earlier this week. TikiTalk is essentially just Tinder minus the swiping and plus an activity function. On the app, you can scroll through various activities you'd like to do, such as go get brunch or, of course, Netflix and chill. Once you choose an activity, the app shows you available users around you who are interested in doing the same thing. Anh said he and his partner have no current plans to make money off the app, but can see opportunities in the future for employing the app's strategy with sponsored activities, such as suggesting a nearby Calvin Harris concert as a date. Netflix and chill lovers can download the app for iOS here.